Here is a beautiful way to arrange your Thanksgiving table and keep guests happy with some snack food as you finish up the gravy and heat up the green beans. Cut out long thin strips of paper, 8 x ¾ inches for each person. With the scissors, curl the ends of each strip of paper, making sure to leave ample room for the name of each person. Write the names of all your guests on the pieces of paper, and set aside to dry. 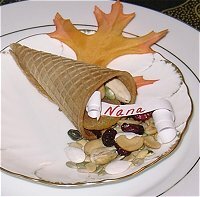 Place the sugar cone on the plate, and loosely fill the cones. Place on the plate and let the contents slightly spill out onto the plate. Tuck the names into each cone and place on the table where each person is supposed to sit. If you’re feeling extra creative, soak your strips of paper in coffee for a few minutes and let dry. This will give them a beautiful light brown color. Instead of cutting them, rip the ends for a rustic country look that is easy and elegant.